Coconut Barfi is one of the rich and easy sweet dish that can be prepared at home. When I first learned to cook this flavorful dessert from my MIL, I was so excited by how simple recipe it was. 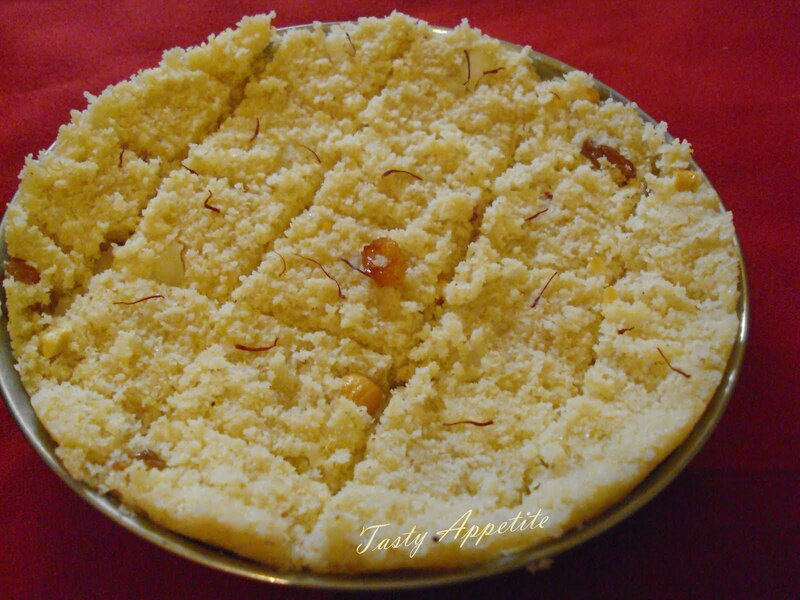 Now, I am preparing this delicious barfi frequently and it is liked very much by all at my home. The speciality of this dish is its chewy, rich creamy taste and this can be prepared in advance for festive occasions as it has the shelf life of about 10 days..! This is how we make this traditional Indian mithai coconut barfi..
1. 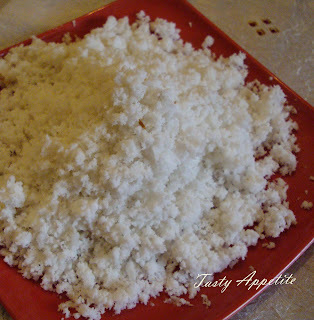 Grate coconut to pieces and grind to fine shreds. 2. Heat a thick bottomed kadai. 3. 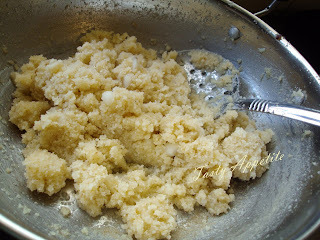 Add ghee and allow to heat. 4. Roast cashew and raisins to golden. 6. 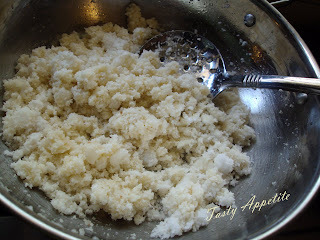 Add ground coconut shreds and roast in low flame. 7. Continue roasting till the moisture content is absorbed and lets out rich aroma. 9. In a separate bowl , boil water. 10. Add sugar to it and keep on stirring, till the sugar comes to syrup consistency. 11. Now add milk to it and continue stirring for two more minutes. 12. Add this thick liquid to the fried coconut shreds. 13. Keep the flame in medium and stir constantly. 14. 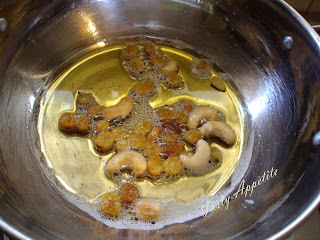 Add cardamom pwd, vanilla essence and stir, till the contents are blended thickly together. 15. Now add roasted golden cashew and raisins. 16. Stir until the mixture looks thick. 17. Remove from flame and pour into a ghee smeared plate. 18. Flatten the surface and garnish with saffron strands. 19. When warm, cut into square or diamond shaped barfis. 20. 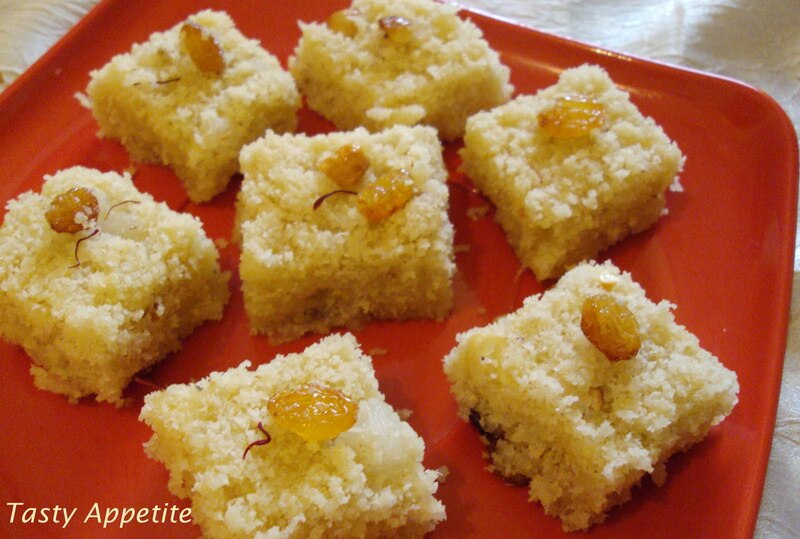 Yummy coconut barfis ready to enjoy….you cant possibly just eat one..! Jay, that looks simply awesome - I made these in May and it was a huge hit!!! What a grat combination; my husband loves coconut and this would make his day; thanks. What sweet and tasty bites! wow..Real tempting one..mouth watering burfi..pass me one!! wow, jay, another scrumptious delight! never thought about putting saffron in a dessert! Pass it on to me please! one of my fav childhood sweet...mmmm...so tempting yaar..addition of vanilla essence is new to me...makes it more flavorful rt??? Love your burfis... Looks yummy.. Btw, i have not tried sugar-- syrup consistency.. any tips?? Hi Jay lovely barfi! Never tried the sugar syrup version always heated the sugar and coconut together.Will try this out. 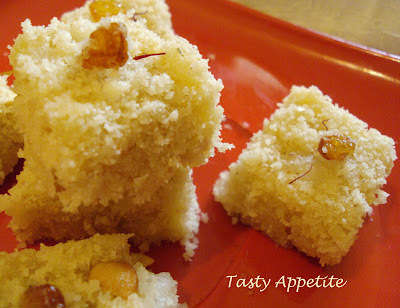 Thats super wonderful...coconut barfi from fresh coconut..what else do want.. I'm looking forward to making this for my mom. It looks so delicious, I know that we're going to love it! Coconut burfi's are looking so good! Jay, they look really delicious, I'd love one with a cup of coffee. Se ve un postre delicioso con el coco rallado. I love coconut so I know I would love this! Lovely looking tempting recipes. Excellent preparation. Absolutely tempting!! Would love to have a bite.. This is my favorite..They look super-delicious. Thanks for sharing the step pics.. Simple and yummy recipe!Thanks for sharing,dear! 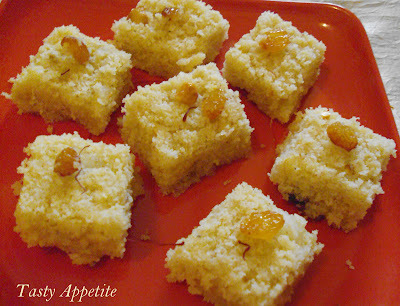 Coconut burfi looks fabulous, yummy, tempting and perfect. Gorgeous presentation. That looks wonderful. Perfect for my sweet tooth. 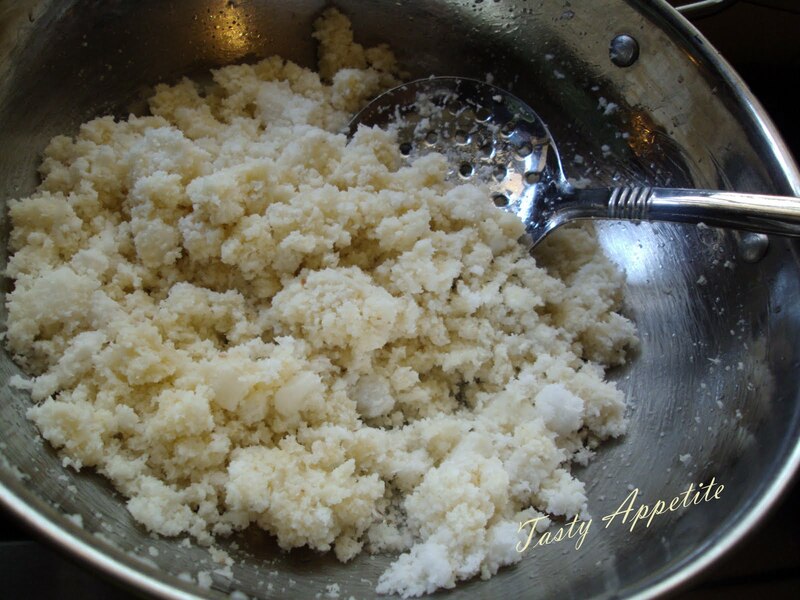 I would like to invite you to our "Quick and easy recipe mela" and enter your recipe. We would be glad to see your participation. Thanks. Very addictive and my fav burfis,..yumm! This is so perfectly made burfis.. hv never seen homemade so perfectly done.. Awesome.. Awesome Burfi,looks so perfect.my fav!! Ciao, adoro il cocco e questa ricetta è meravigliosa!!! Burfi looks tempting, came out perfect. Oh my just love it..looks delicious. Thank you so much for stopping by to have tea with me. I came right over to check out your great blog and to follow you back and I see that Blogger is after all our friends again. I am sure they will come back and when they do you will see me there. It's great to meet you! Looks great Jay. I love how delicious this look. Have a great weeke ahead. I have never heard of barfi but, coconut desserts are my weakness. This looks incredible. Fantastic recipe! It's perfect for tea time! Thanks for sharing! Wow these would be my ideal snacks any time of day! I've never had these before but know I would love it. Beautiful photos! Cocunut barfis are one of my favourite Indian sweet. Love this recipe of yours!! Thank you for visiting me! I love coconut and this sounds delicious. Thanks for making me drool once more ..:) Romba sooper.. I love the coconut fragrant in it. I would love to try this...looks delicious! Thanks for visiting my blog Jay! This looks so delicious! I used to visit a sweet shop in Sydney sometimes that sold the most gorgeous burfi and rasgullahs, but I have never made them myself! What is the water measurement for 2 cups coconut? For this recipe, 1 cup of water is required to dissolve sugar and make sugar syrup. for 1 cup of sugar, 1 cup of water is needed Velpriya.